Occupying the central part of Ghana, the Volta Basin covers about 45 percent of the nation’s total land surface. 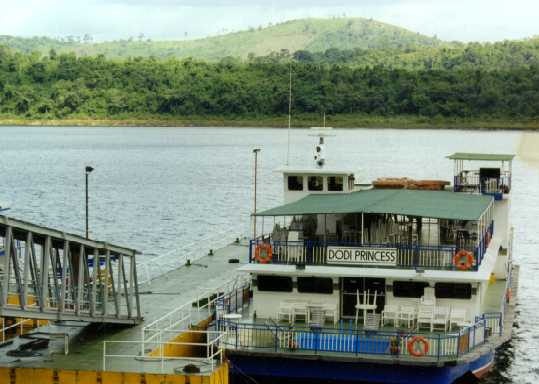 Its northern section, which lies above the upper part of Lake Volta, rises to a height of 150 to 215 meters above sea level. Elevations of the Konkori Scarp to the west and the Gambaga Scarp to the north reach from 300 to 460 meters. To the south and the southwest, the basin is less than 300 meters. The Kwahu Plateau marks the southern end of the basin, although it forms a natural part of the Ashanti Uplands. The basin is characterized by poor soil, generally of Voltaian sandstone. Annual rainfall averages between 1,000 and 1,140 millimeters. The most widespread vegetation type is savanna, the woodlands of which, depending on local soil and climatic conditions, may contain such trees as Red Ironwood and Shea. The basin’s population, principally farmers, is low in density, especially in the central and northwestern areas of the basin, where tsetse flies are common. Archeological finds indicate, however, that the region was once more heavily populated. Periodic burning evidently occurred over extensive areas for perhaps more than a millennium, exposing the soil to excessive drying and erosion, rendering the area less attractive to cultivators. Renewed efforts to improve communications, to enhance agricultural production, and to improve standards of living began in earnest only in the mid-1980s. Navigation on the Volta River has changed significantly since 1964. 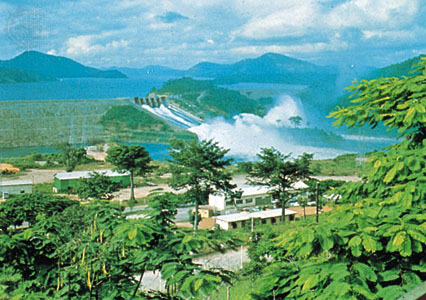 Construction of the dam at Akosombo, about eighty kilometers upstream its potential as a source for irrigation is reflected in agricultural mechanization agreement signed in the late 1980s to irrigate the Afram Plains. 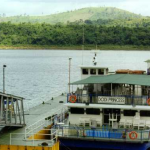 The lake is navigable from Akosombo through Yeji in the middle of the country; a twenty-four-meter pontoon was commissioned in 1989 to link the Afram Plains to the west of the lake with the lower Volta region to the east. 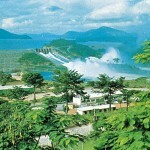 Hydroelectricity generated from Akosombo supplies Ghana, Togo, and Benin. Labadi Pleasure Beach (Accra): A three kilometre sea frontage at Labadi, 8 kilometres east of Accra on the Accra Tema Beach Road. It serves as Accra’s main public beach with only shower and changing room facilities and catering services. Kokrobrite: Kokrobite near 30 kilometres west of Accra. A sprawling beach with a dramatic backdrop of hills. It is a favourite of tourists because of its serene atmosphere and its almost secluded nature. Ada beach: This coastal town, 100 kilometres east of Accra, on the Lome Road has this beach with facilities for yatching, skiing, fishing, etc. 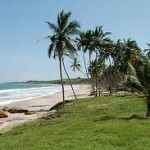 Cocoloco Beach is located at Ada Foah – about an hour east from Accra where the Volta River meets the Atlantic Ocean. The area is a natural paradise and a breeding ground for a variety of sea turtles. The Volta Estuary is also a sanctuary for an enormous number of birds. Cocoloco has camping and accommodation in a number of bungalows built in a traditional thatch style. To get there, head east from Accra and branch right at the Kasseh-Ada junction. If you are coming by “tro-tro” or commercial bus, get out at the last stop and ask a taxi to take you to the Cocoloco Beach Camp Resort near the village of Totimekope. Alaska Beach: Located on the shore of the Gulf of Guinea on the Atlantic Ocean, the Alaska Beach Club is a popular retreat for backpackers and those in search of a quiet beach away from it all. In addition to camping facilities, there are some simple bungalows, plus showers and toilets. 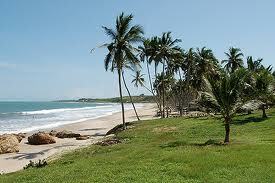 It is adjacent to the Busua Beach Resort where some visitors take time out to rent Sea-Doo’s and other watercraft.